I know I’m a little late to the Pac-Man CE party, but I was also late to the Xbox 360 party, so don’t worry about it. I managed to find a copy of Namco Museum Virtual Arcade for $20, which has several Virtual Arcade games on it plus a ton of old Namco arcade games, and I had been wanting Pac-Man CE for a while now, which is $10 on its own, it seemed like a no-brainer to pick up the compilation. It’s kind of hard to explain what the game is without actually playing it or seeing it, but it’s essentially same old Pac Man experience with a few twists. The maze is divided into two halves, each with a configuration of dots. Eat all the dots on one side and a fruit appears, eat the fruit and the other side of the maze it repopulated with dots, and occasionally the maze is reconfigured slightly. Instead of having to just go forever until you run out of lives, you instead have discrete time limits to score as many points as you can. You still have to worry about running out of lives, but you get lots more (every 20,000 points instead of just one at 10,000). But this is a game about scoring points. You eat the ghosts, you get points. You eat a second power pill before the first one wore off, you get more points (up to 3200 points per ghost). You stay alive long enough and the dots are worth 10 points, then 20, then 30, then 40, and then 50 (if they get higher than that I don’t know, I didn’t last long enough to find out…), and the bonus fruits get more lucrative as well. Heck, the bonus fruits started go through stuff out of Super Pac-Man (eggs, cake, hamburgers, and coffee), and then from Galaga (enemy ships and the like), and culminated with a Crown which is worth 7650 points. 7650 points, of course, being some kind of pun in Japanese (it phonetically sounds kind of like Namco, I’ve been led to believe). Death is far less of a big deal here than it had been. You croak and the ghosts are returned to the pen, and you rematerialize back where you stopped, though your point values for the dots reset, that’s kind of a bummer. Even so, death is a bit of a reprieve after a while. As you keep playing the game, the speed gradually increases to the point where you’re zooming around so fast that you get afraid to blink. It was about that time where I found myself missing the occasional turn, which I’d love to blame on the controller, but have to give the nod to my comparatively sluggish reflexes. Since this game’s on the old 360, there’s also the matter of achievements. There are 12 of them, and I was able to unlock them all in less than an hour and a half. They’re for piddly things like scoring 100,000 points or clearing each of the game modes. Maybe I’m just that good at Pac-Man from wasting a not insignificant portion of my youth in local arcades. But that’s not going to keep me from playing the crap out of this game. It’s way too approachable for that. Videlectrix is the fictitious video game company that’s referenced on the Homestar Runner web site. Their ‘thing’ is that they create video games in a fairly old style, kind of like Atari 2600 or old DOS-style games. Like Duck Guardian One, for example. It plays a whole lot like Lemmings, only instead of Lemmings you have Ducks, and instead of assigning various jobs to the Lemmings, you shoot the ducks with various ‘Rays’ that have different effects, like turning them around or making them jump. Your goal is to get a sufficient amount of them to the safety of the ship on the right side of the screen with minimal casualties. And that’s pretty much all for this game. Every few levels you get a new gun and the ducks move faster and have more crap to avoid. The game apparently has some kind of ending to it, but I got bored about nine waves in, once I got the freeze ray. After that, there was too much juggling ducks and rays for my taste. Not to mention that I kind of ran out of ducks and my game ended. No big loss, though. I’m actually pretty confident that I’ve seen everything in this game that I care to. And if I ever change my mind about that, I know where this game lives, so I can blow a few minutes reminding myself of what I thought about it, which wasn’t much. With every generation of the portable pokémon games, we get treated to a 3D version that lets us battle out little beasties in three of the best dimensions that I’ve ever been a part of. But they also add a little extra, like a tutorial mode, or enhanced management utilities, or even a whole, separate RPG mode. So, when I saw that the companion game for the DS versions of the portable series was coming out for the Wii, I pretty well disregarded the reviews that I saw. All of the companion games score pretty low as a rule, mostly because they’re reviewed as standalone products instead of the companion products that they really are. Which is to say, if you don’t have the portable game that goes along with each console title, your fun is going to be extremely limited, and that’s fair. But I do have Pokémon Diamond, so it was pretty well a no-brainer that I’d pick up the companion game for it. Pokémon Battle Revolution is a whole lot like the Stadium and Colosseum games that came before it. You take your team of monsters that you raised up in your portable adventure and make them fight each other in a ridiculous amount of preprepared situations. After three games, that’s not really much to write home about any more. But, like the other games that preceded it, the most fun you’re going to have is when you get a friend wrangled into playing the game with you, so you can see who’s the better Pokétrainer. But, that can actually get kind of tough, so this game actually takes advantage of the Wii’s newfangled ability to connect to the Internet to allow you to play battles against folks all over the world… who are mostly far, far better than you are. But other than the battles, what kind of other features do you get with this game? The only real thing you can do, other than the battles, is look at a few static pages of text that offer up some battle strategy, most of which is so basic that it’s essentially worthless. There are no mini-games, no tutorial battles, no extra RPG mode, and no Pokémanagement utilities. What you get is a kind-of okay, sort-of flashy 3D interface to your battles, which is nice, but it just doesn’t seem like you get a lot to do for the $50 entrance fee. It’s a pretty regular occurrence, you’ll buy a compilation of old games for your newfangled system because of the awesome game on the front, then when you get it home you realize that in order to get the ‘included games’ number up to a respectable level the developers were kind enough to include some ‘also-rans’. 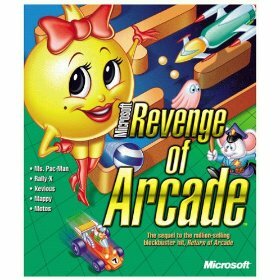 Like Microsoft’s Revenge of Arcade. Check out this box art. This game compilation should have been called ‘Ms. Pac-Man and Some Other Stuff‘, since Ms. Pac-Man is what most folks are going to buy it for. But you install it… and some other games mysteriously show up on your computer. 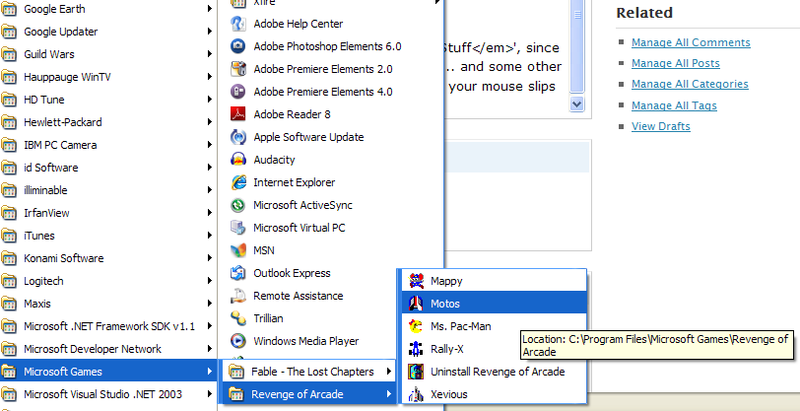 Then you go to get your Pac on and your mouse slips down a notch and you accidentally click on something else. The game that I accidentally clicked on was something called Motos. A bizarre little game that I had never heard of before that stars you piloting some kind of ship on a platform. Your goal is to crash into the other… inhabitants of the platforms while they try to do the same to you. The enemies are faster, more maneuverable, hit harder, and more numerous than you, so you definitely have your work cut out for you. The game is fun for about the length of time it takes you to play it once, so it kind of depends on how skillful your are with your ship maneuvering. But you’re going to see all that you need to see inside of fifteen minutes with it. I wasn’t that impressed by it, and after playing it twice, just to make sure that it was as mediocre as I thought it was my first time through. It was, so I resolved to be more careful with my mouse clicks in the future. Some days when I went to my local arcade with the express intent of playing the sole copy of the Mega Man arcade game that I’ve ever managed to find, I’d only be greeted with a sign saying that it was out of order. In those cases I was pretty well obligated to play the other game in the arcade. And, yes, I realize that an arcade with two games in it isn’t really much of an arcade, it’s more of a closet with a couple of games in it. But the sign above that closet said ‘arcade’, so that’s the nomenclature I’m going to use. But, anyway, the other game in the arcade was a little game called Ridge Racer, which was a game that I had heard of before, but never owned any of the systems that the home versions came out on, and had never seen the arcade version of the game in person before or since. Ridge Racer is a racing game, but the hook is that it’s not your bog-standard racing around a track, it’s racing down streets while fishtailing wildly around the course… er, I mean drifting. I’ve admitted that I don’t really like racing games in the past unless there’s some kind of hook. But the hook in this game is kind of lame. Maybe I’m the weird one because I don’t find that keeping your car on the razor’s edge between in control and out of control to be a particularly compelling mechanic. It’s like you’re playing a game that consists of you driving a car with tires made of ice full speed around a track, also made of ice, but it’s not quite cold enough to keep them frozen, so there’s slippery water everywhere, which is slightly less control than I like. Thankfully Mega Man rarely stayed broken for long. Whenever I play most of the games by Popcap, oftentimes I can’t help but think that I’ve ‘been there, done that’. 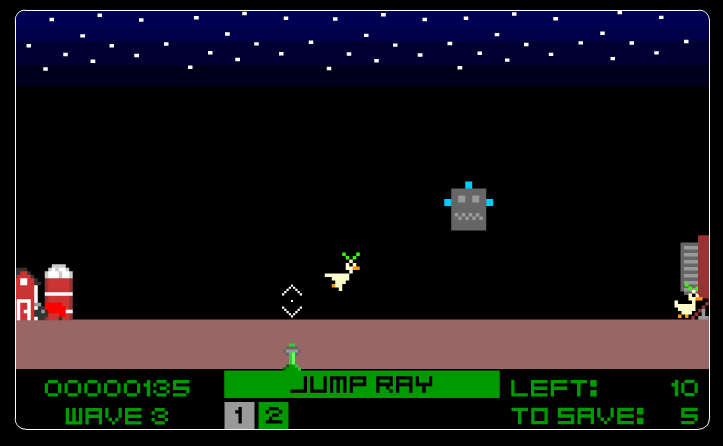 Take Astro Pop, for example, it’s a pretty blatant clone of a kind-of-obscure game called ‘Magical Drop‘. So, if you know how to play that game, then you pretty much know everything you need to play this one. Basically, there’s some story about some guys that go through space for some reason, why is pretty immaterial. What you need to know is that there is a series of colored bricks that descend from the top of the screen if they hit the bottom, well, then you lose. But you’re not totally defenseless, you have the ability to grab as many of the same colored block as you can and then throw them up to the top of the screen. Match up four or more in any direction and they disappear, and if you’re feeling really ambitious, you can try to set up chain reactions. I only played Astro Pop one time, mostly because it was not on my Xbox 360 (which means it was free to me) and because I was really bored (compiling software takes a long time). So I played it and made it to the mid-teens, all the while thinking that I had already played this game before. So, after that little experience I decided to pack this game back up and not play it again. And that doesn’t really have that much to do with the fact that I don’t actually own an Xbox 360 of my own. I never really could decide which game I liked better out of Quake 3 and Unreal Tournament. It was kind of a false dilemma anyway, so I just kind of played them both… poorly. A few years later, though, and we got a sequel to Unreal Tournament, which a lot of the folks in this area gravitated to, and Quake 3 just kind of fell to the wayside. It’s interesting to me, then, that Unreal Tournament 2K3 actually started to look a whole lot like Quake 3 had. I actually ended up playing this game a lot less than I had the original Unreal Tournament game. Mostly because I didn’t actually get the game until several months had passed since its release. Then, once I did actually get it, I only played it LAN parties. In fact, I only bought the thing so that I’d have something to do at the LANs. Then, a few months after I finally capitulated and bought the game an incremental sequel with slight tweaks and a few additions was released, Unreal Tournament 2K4. That was the last straw for me. I refuse to be caught in the ‘buy a new football game every year with updated rosters’ upgrade treadmill. Not only that, but a scant couple of months after I bought 2K3 all the folks at the LANs I went to abandoned it and went to the new darling of first-person shooters. So, not only did I not get into 2K4, I removed 2K3 and resolved to not play it any more if I had to keep upgrading every year. Another of the games in the After Dark Games collection was a weird little adventure game based on the screensaver that made the company famous, flying toasters. So how would you make a game about flying toasters? It turns out that it’d be a pseudo-3D affair that tasks you as the titular toaster in a quest to fly through a house that’s rife with anti-toaster everything, and you have to gather up all of some baby’s discarded toys and then put him, her, or it to bed. This is actually the most complicated game in the collection. Mostly because it’s kind of hard to navigate your ridiculous toaster through the ridiculous house, collecting crap, and trying to get to the end. It’s not actually all that exciting. I played this game a little bit, but didn’t ever make it very far into it. Mostly because, compared to the other games in the collection, it was exponentially more complicated than any of the others. It also wasn’t just something you could pick up and have some success for about a minute or so like some of the other ones. In fact, the only times I can remember even starting the thing was either: to see what it was like or because I accidentally clicked on it when I meant to play something else. I’m reasonably sure that you’re familiar with Monopoly the board game. It’s a relatively loose interpretation of buying and selling real estate. So sure am I that I don’t feel any great need to explain to you how it works in any kind of great detail. Basically you buy, sell, and trade properties in an effort to run your opponents out of money. The video game adaption of this game is pretty much exactly the same as the board game version, with a couple of kind of important exceptions. Probably the most significant for me were that: there were no tiny pieces to lose and calculating crap like Luxury Tax was way easier if I let the computer do it. Also, I suppose I should mention that you can make computer players take the place of regular players if you don’t quite have enough to flesh out your game. In all the times I played the old-fashioned analog version of this game, I don’t think I’ve ever actually played a game to the end. The reason being that this game takes hours upon hours to play if your players have any skill whatsoever. Well, that and as the turns progress they become logarithmically longer to complete. That’s bad enough, but you can at least talk amongst yourselves and collude with each other to take down whoever’s in the lead. But, if you have the computer taking over one or more, then you can’t really expect intelligent discourse on… well any topic, really. You just kind of have to sit there while it does whatever crap it does, including offering you a ridiculously low amount of money for Marvin Gardens. And just kind of wait until it’s done its thing. So, you play your turn, and then wait about fifteen minutes while it has its turn(s) before you can go again. In other words, play a turn, make and eat a sandwich, play a turn, mow the lawn, play a turn, wash the family goat, play a turn, etc. After a few rounds of that, not only did I not actually finish my game of video Monopoly, but I never put it in my NES again, either.